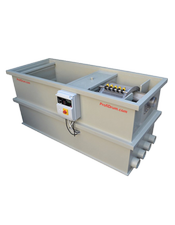 As Water gravity flows from the pond to the Profidrum RDF any solids down to 70 microns in size are caught in the filter screen as the pond water flows through the unit. After the pond water has filtered through the Profidrum RDF, it is pumped through additional filtration for further cleaning and then returned to the pond. 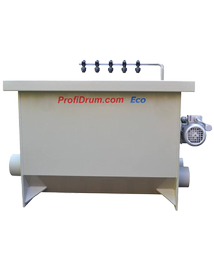 As waste builds up on the screen, the water level in the Profidrum RDF will lower until the preset cleaning level is reached. 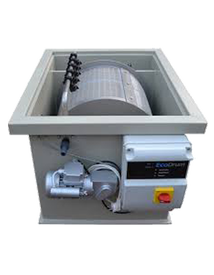 When this happens, the cleaning nozzles activate and push the accumulated waste into the disposal outlet during the cleaning cycle. 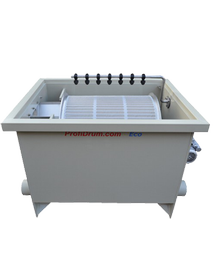 After the cleaning cycle is performed, the Prodfidrum returns to normal operation.